Santa Cruz Organic® Fruit Spreads are ideal for holiday entertaining. Try them with your favorite cheese and bread combinations. Add some figs and spiced nuts for holiday platter. 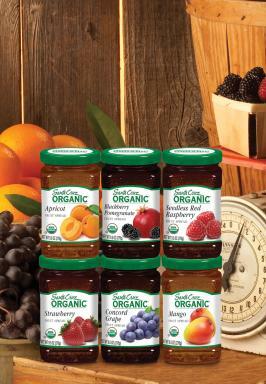 Santa Cruz Organic® announces two new flavors of Fruit Spreads: Mango and Concord Grape. Same as the other four flavors, fruit is the first ingredient of the recipe made without high fructose corn syrup or artificial ingredients. Santa Cruz Organic® currently offers more than 80 organic items ranging from organic fruit juices and sparkling beverages to organic fruit sauces, chocolate syrups, peanut butters and fruit spreads. As a pioneer organic brand, Santa Cruz Organic® was the first to have a wide range of organic, 100 percent juices and blends and the first juice processor to use all organic fruit sourced from growers certified by an independent, third-party certification organization. CHICO, Calif. (March 27, 2013) – Celebrating the spirit of helping others, Santa Cruz Organic® awarded four grand prizes to winners as part of the Sweet Deed Society promotion that ran from May 24 – October 3, 2012 on the brand's Facebook page. Margaret P. of Anniston, Ala. and Stephanie M. of Portland, Ore. each won a beach vacation, awarded as a $3,500 check and Crystal S. of Palmyra, Mich. and Alita A. of Bremerton, Wash. each won a home computer upgrade, awarded as a $2,000 check. 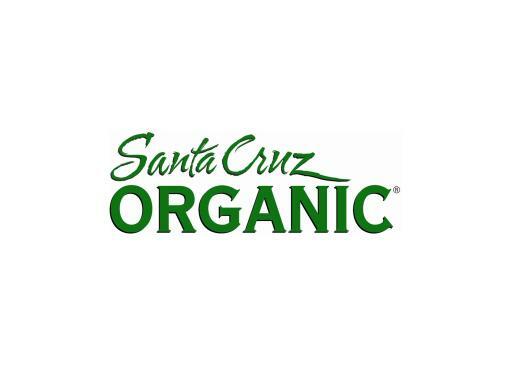 Cases of Santa Cruz Organic products were given to 36 do-gooders as weekly prizes. Winners were selected at random from the nominators and nominees that joined the Sweet Deed Society to recognize a friend or family member for doing a good deed. Spreading the good deeds even further, for every sweet deed nomination, Santa Cruz Organic made a donation to Feeding America®, the nation’s largest domestic hunger-relief organization. The donations were used to provide meals for families struggling with hunger. As a pioneer organic brand, Santa Cruz Organic was the first to have a wide range of organic, 100 percent juices and blends and the first juice processor to use all organic fruit sourced from growers certified by an independent, third-party certification organization. With a history of developing innovative products, Santa Cruz Organic currently offers more than 80 organic items ranging from organic fruit juices and sparkling beverages to organic fruit sauces, chocolate syrups, peanut butters and fruit spreads. Visit www.santacruzorganic.com or www.facebook.com/santacruzorganic for more information. Feeding America® provides low-income individuals and families with the fuel to survive and even thrive. As the nation’s leading domestic hunger-relief charity, our network members supply food to more than 37 million Americans each year, including 14 million children and 3 million seniors. Serving the entire United States, more than 200 member food banks support 61,000 agencies that address hunger in all of its forms. For more information on how you can fight hunger in your community and across the country, visit www.feedingamerica.org. Find us on Facebook at www.facebook.com/FeedingAmerica or follow our news on Twitter at www.twitter.com/FeedingAmerica.